The English Integration Program began in 2008, with the goal of building English language capacity among our Spanish-speaking staff members. This program emerged from our realization that learning English could help us connect with other communities of color and make our voices be heard by a wider audience – not the interpreter’s or bilingual coworkers’ voices but our own. We also realized that not having a basic understanding of English has a negative impact on our members who, for example, may not be able to communicate with the police to defend themselves from abusive partners, or with an employer when applying for a job. MUA’s English Integration Program first began with extensive surveys and research, followed by the piloting of an ESL class specifically for MUA staff in 2011; this class continues and grows to this day. We also have implemented new strategies for integrating English use within our organization. 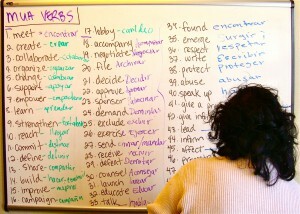 In addition, we have designed and implemented our own curriculum for ESL classes for our members. Currently, we offer vocational ESL classes for domestic workers via our Caring Hands program and we also offer classes for Domestic Violence Advocates and Sexual Assault Crisis Counselors who interface with other service agencies. utilize a communicative teaching style based on popular education methods.